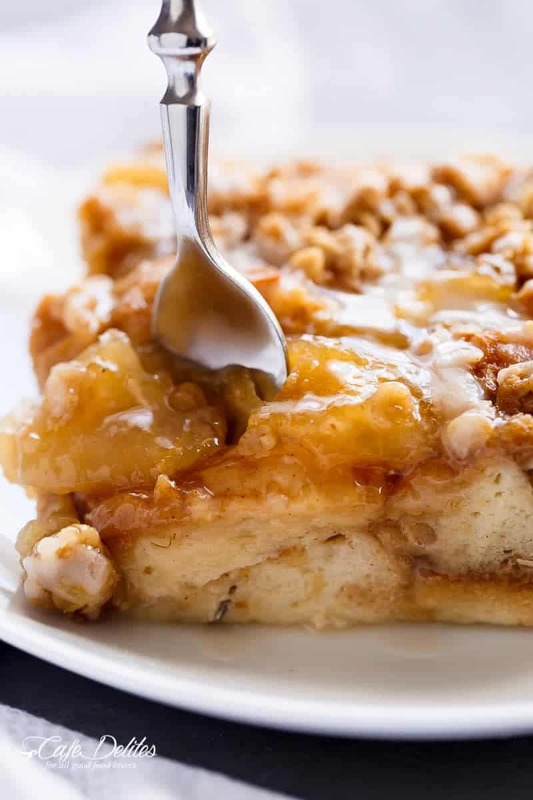 TWO desserts collide into one irresistible breakfast with this Apple Pie French Toast Bake! 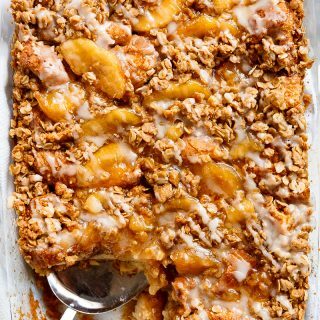 This casserole, also known as bread pudding, is a family favourite breakfast! 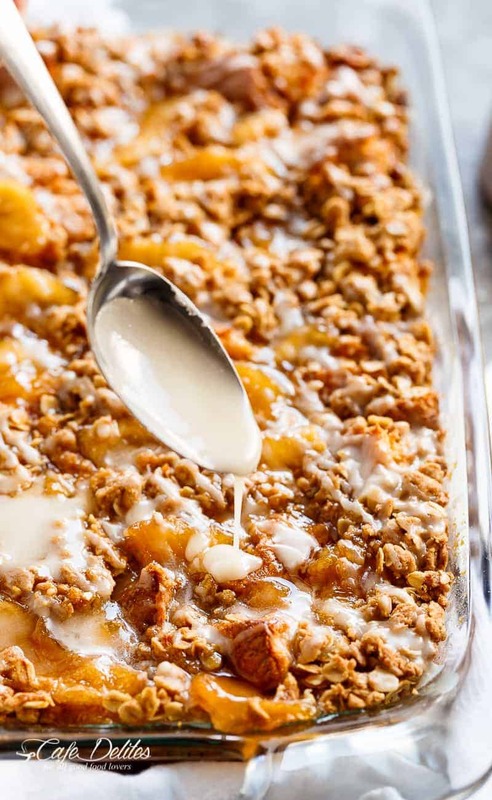 All I can say is; this Apple Pie French Toast Bake made my oven and stomach happy! Soft french toast sits beneath cinnamon flavoured apple slices, topped with an incredible crisp topping for a crunch texture (WHICH IS OPTIONAL), and finished with a drizzle of maple flavoured frosting. My world of desserts for breakfast — on special occasions — isn’t that bad, really. Right? If you’re looking for a savoury casserole to feed a crowd, check out this LOADED Sweet Potato Hash Brown Breakfast Casserole. However, if you’re a hopeless romantic sweet tooth like me, this would be right up your cravings alley; around the corner from hormone city and down the street to dessert haven. Not a bad place to be in. 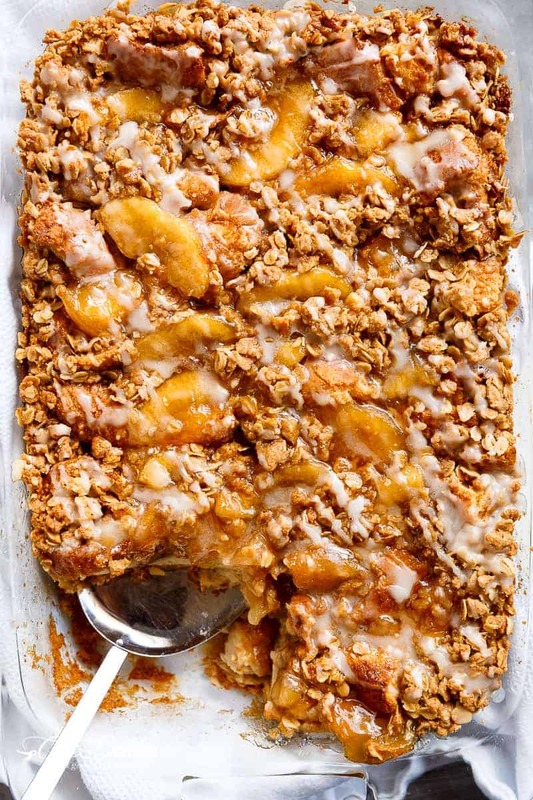 If you remember the Easy Cinnamon Apple Crisp from a month ago — way back in time — THAT crisp has stayed with me, haunting and taunting me to be made again….and again….and again. But, how to make it completely acceptable for breakfast, a long with some protein to fill us up enough to wait for the next meal, without being thrown into a fit of starving mad rage. French toast. The logic side of my brain says NO, this is not a healthy breakfast food. Oh, but the apple pie / french toast lover that resides deep in my soul says yes a thousand times over. The side of me I try to squash down with smoothie bowls and chia puddings. This. Apple Pie French Toast Bake. For thanksgiving. Or for any time, really. Is. Just. Everything. Heat a medium-sized pot over medium-high heat. Melt butter; add apple slices, sugar and cinnamon; mix through to evenly coat. Cook for 10-15 minutes until apples are soft and tender. Spray a 9x13 dish with nonstick cooking spray. Arrange the diced bread in the baking dish; set aside. In a medium-sized mixing bowl, whisk together the eggs, milk, sugar (or sweetener), vanilla and cinnamon. Pour the egg mixture over the bread. Press bread down into the egg wash to completely soak. Pour the apple pie filling over the top of the soaked bread. In a medium-sized bowl, combine the oats, flour, brown sugar, cinnamon, baking powder and melted butter. Mix well using a spatula or your fingertips,to soak the butter through the dry ingredients. Sprinkle evenly over the soaked bread in the baking dish. Cover with plastic wrap and refrigerate for at least 30 minutes, or overnight. Preheat oven to 175°C | 350°F. Remove baking dish from the refrigerator and bring to room temperature for 20-30 minutes. Then bake for 40-50 minutes until the crisp is golden browned and the casserole is completely cooked through. In small bowl, whisk the glaze ingredients. Drizzle over casserole. Uh, yeah, this is in the oven right now…. For dinner. I couldn’t wait until breakfast!! It smells amazing. If it tastes half as good as it smells, I will be a very popular person at my house!! Update…It was awesome!! Total keeper! This looks AMAZING! I think I will prepare this for Christmas morning. My kids will love it! We never have really sweet stuff for breakfast, so your recipe will be something extra special. Thank you! 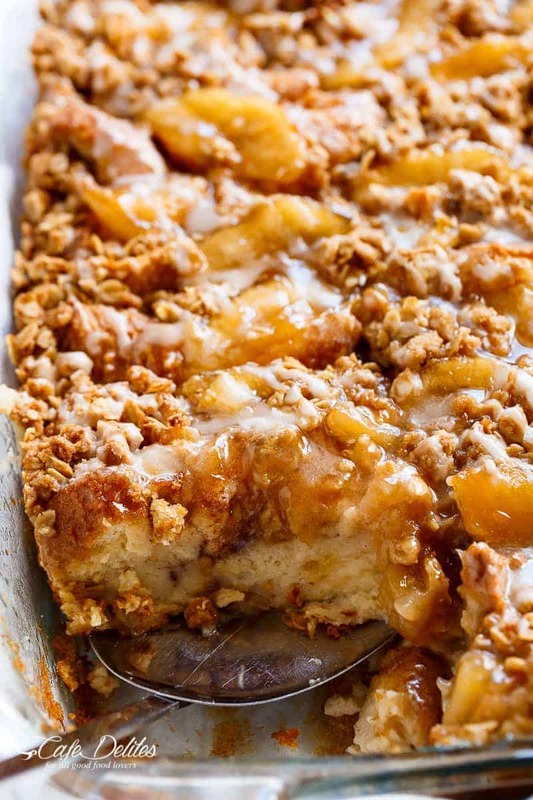 How dreamy does this french toast bake look? Apple pie + bread pudding sounds like heaven! Defs would eat this is bressert! Bethany! YES! I love how you speak my language!